When poured, this beer smells of citrus, grapefruit and hops. When Ranger hits the pallete you are reminded of an American Pale Ale with a bit more bite than most APAs. It has a medium finish and the hops linger on the tongue like you'd expect from a good IPA. This beer has more of a bitter hop flavor than most regular IPA's and therefor we don't suggest this as a transitionary beer for a beginner into the style. 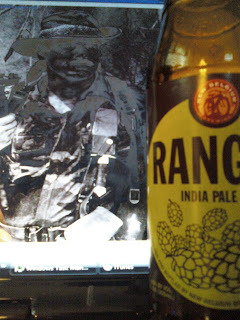 New Belgium's Ranger is what a pale ale should taste like. We might be a bit biased since we normally like a bit more bight when we drink an IPA as we are used to drinking their imperial counterparts in the 7.5-11% range. This brew is incredibly solid for what it is and if sitting on our the shelf of a local grocery, it'd battle our wallet with our local favorite, Commodore Perry by Great Lakes.